Maurizio Abate is a self-taught guitarist who’s been active since the early 2000s with an instinctive approach to experimentation and always in connection with the deep power of the sound. 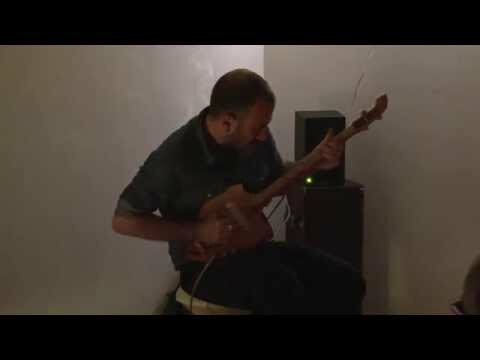 Constantly looking for new forms of expression, he is committed to shape the blues, folk and psychedelic tradition in a personal and unique way. Driven by a strong fascination for stringed instruments, Abate started performing live in 2006, playing electric guitar in a style ranging from free-from, noise and ambient and after being involved in some impro-psychedelic projects (Eternal Zio, Neokarma Jooklo, Golden Cup, Rella the woodcutter, BeMyDelay) he has developed a new live performance, based on a processed hurdy-gurdy, harmonica and electronics through which he creates meditative, forlorn, ritual soundscapes. 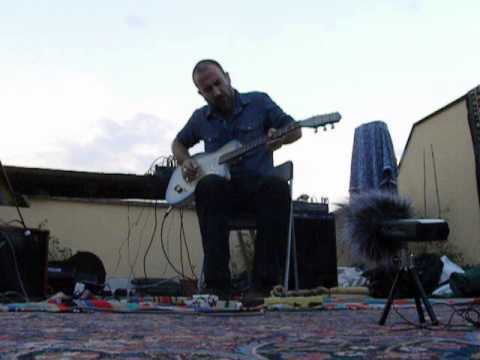 At the end of 2013, he curated the preview screenings of the documentary “In Search of Blind Joe Death: The Saga of John Fahey”, by the Canadian director James Cullingham, all over Italy, giving occasional solo performances on guitar before selected screenings. This experience informed “Loneline Desire and Revenge”, an LP on Black Sweat Records, which documents the transition from electric sound and practices of improvisation to instrumental songwriting for acoustic fingerstyle guitar. and with the designer-musician Canedicoda on a project called “Arbre du ténéré”, they release an LP entitled “La pelle del fantasma” on Holiday Records and a cassette called “Quando gli uomini adoravano la luna” on Yervan Tapes. Beetwen 2015 and 2016 he worked on a new collaborative album with the electronic musician Matteo Uggeri. In 2009 and 2010 he’s also been a music collaborator for the Merce Cunningham Dance Company, having the honour to perform on “Nearly Ninety” together with Takehisa Kosugi and John Paul Jones. He has participate in more than 20 records published by Alt Vinyl, Black Sweat, Conspiracy Records, Troglosound, Qbico, 8mm Records, Holidays, Boring Machines, Tulip, Yervan Tapes, Sloow Tapes.